WHAT DO THEY COST? Custom ketubot are priced according to the amount of time I anticipate that the artwork will require to complete. Simpler works — very personal, colorful and beautifully executed, but requiring less time to complete — begin at approximately $1500 (US). Very much more complex and time-consuming ketubot range to $5000-$6000. My current median price is approximately $2500. 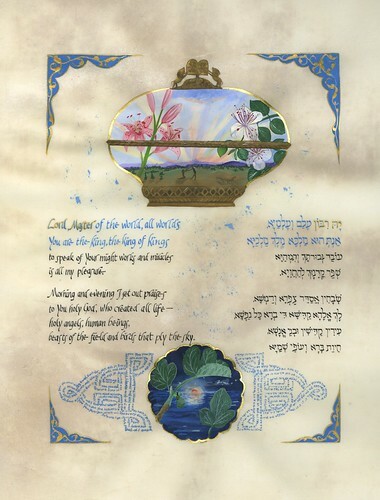 You may notice that my Custom Ketubah Gallery does not include pricing; I will be happy to supply detailed cost information upon your inquiry. My last question in my initial meeting with you will be your budget for your ketubah. “Last,” because price should not color our discussion of your lives and interests! I will take careful note of your tastes, life-stories and interests and find the best possible means of expressing them within your budget. No single factor such as size or shape controls price. Rather, I balance many design factors to arrive at the right design within the budget you provide. Please do contact me with any questions. HOW EARLY SHOULD WE BEGIN? 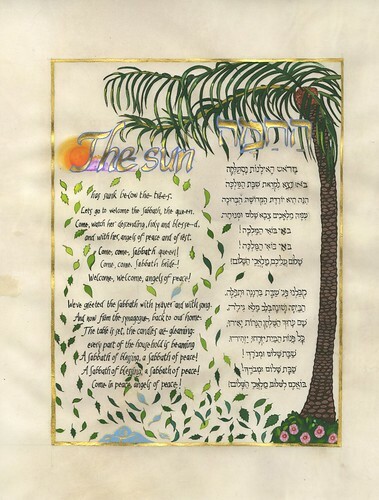 Six to eight months prior to your wedding date is the optimal time working with me to create your original ketubah, yet, more than one of the ketubot you see in my gallery were accomplished in far less time! 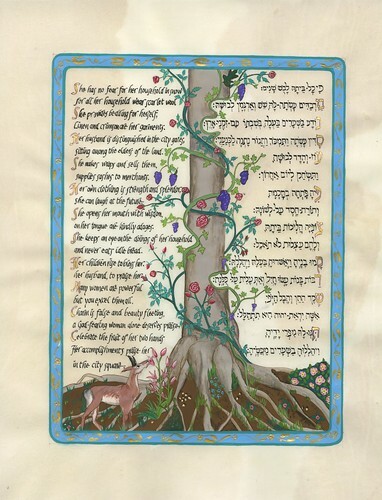 If your wedding date is coming soon, please don’t hesitate to call me, and if it’s humanly possible, I’ll create your glorious one-of-a-kind ketubah. BUT YOU LIVE ACROSS THE COUNTRY? How can this work? This is a problem nowadays? I’ve created hundreds of original ketubot for couples across the US, Canada and abroad, in every case working together closely by means of telephone (my phone bill), faxed or e-mailed sketches, e-mail and careful shipping. Technology rules! CAN WE HAVE THAT ONE? 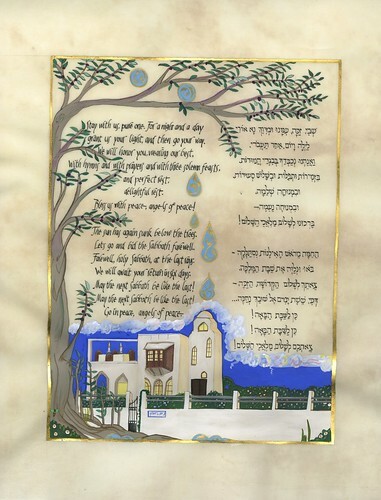 Every custom ketubah I create is one-of-a-kind, and NEVER duplicated. Unlike the “originals” of many artists, I never work with stock designs, just tinkering with details or color. 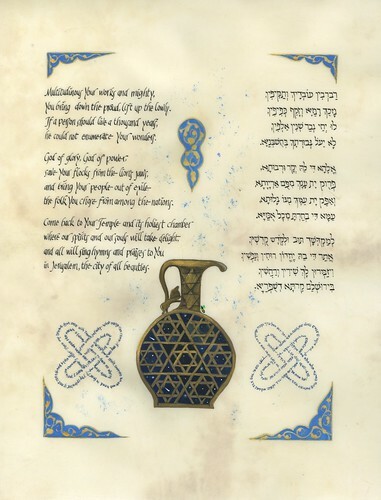 So, if you see an image, or a shape, a color-scheme, or some other detail that draws you, please let me know, but you may be confident knowing that your ketubah will be truly unique, and not another couple’s retooled design. My ketubot are as original and different as the couples who commission them. DO YOU USE HIGH-QUALITY MATERIALS? 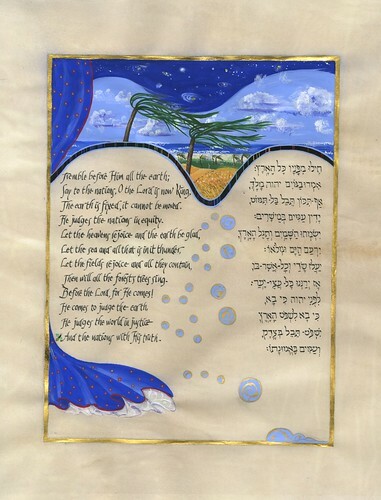 I use the highest quality papers and other materials on every ketubah, regardless of price. Papers are acid-free, glues, backing silks and substrate boards are all conservation-quality, and only the most lightfast inks and paints, non-tarnishable 24KT gold leaf and palladium go into my ketubot. Each work is carefully constructed to last many generations if framed to conservation standards. WHAT TEXTS DO YOU USE? I can work with any variant of the traditional Aramaic text that you and your rabbi prefers (including the Conservative Movement Lieberman text). I have my own fine modern egalitarian texts in Hebrew and English to accompany the traditional text or stand alone, and am familiar with most of the leading such texts available today. We will discuss the most appropriate texts during our initial meeting. 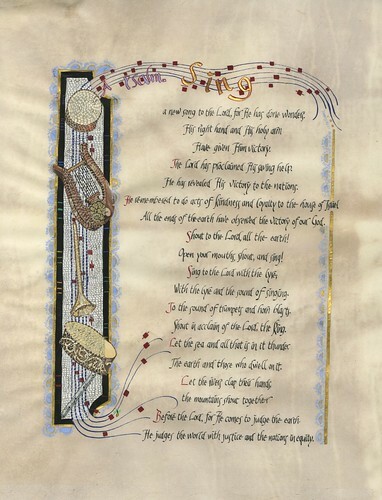 HOW DO WE PAY FOR OUR KETUBAH? I ask for a deposit of 50% of the cost upon signing the commission contract, with the remainder due prior to shipping or picking up your ketubah. 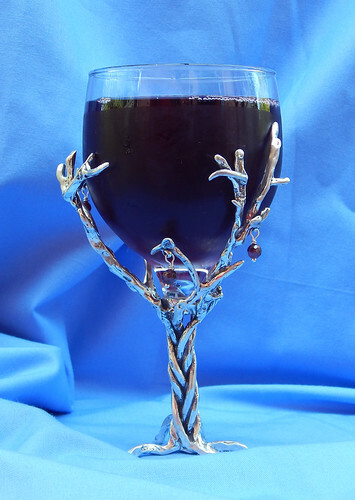 Payment may be made by personal check or credit card. WHEN WILL WE RECEIVE OUR KEUTBAH? My policy is to ship (or invite you to pick up) your ketubah at least one month prior to the wedding date. OK, HOW DO WE GET STARTED? 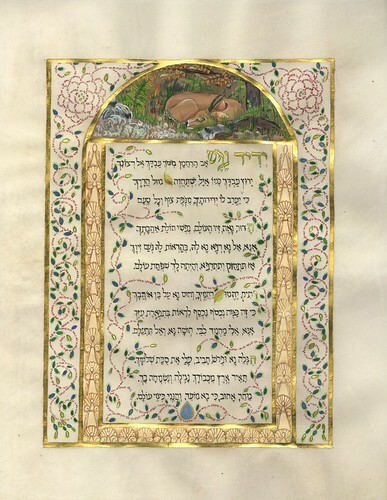 Drop me an e-mail or give a call and we’ll schedule some time either on the phone or in my studio to have a first meeting to discuss your lives and begin to design your own original ketubah. OTHER QUESTIONS?? Contact me by telephone (301)765-6248 or e-mail with any other queries.